Exams are over! I have officially survived my first semester of university! I wrote my organic chem exam today and it was a total disaster but I'm just glad it's finally done with. I can finally focus on other things: family, friends, hobbies, this blog, and you guys, of course. I'm taking a few days to rest before I move back home but I should be back to blog reading and commenting soon, just awhile longer! I'm really excited to show you today's manicure. These nails were loosely inspired by this cute Christmas-y manicure by Esmalteria Neia Belas Unhas. I love putting a spin on a classic french manicure for the holidays. You can check out last year's french over here, including a video tutorial! This time around I did a thicker tip with red bows and rhinestone accents. I used American Apparel Dance to start. I painted on a french tip using the brush from American Apparel T-Shirt. With a dotting tool and American Apparel Downtown LA I made the center of each bow. Then I used a small paint brush to create triangular shapes for the rest of the bows. After that I layered China Glaze Ruby Pumps on top of the bows. 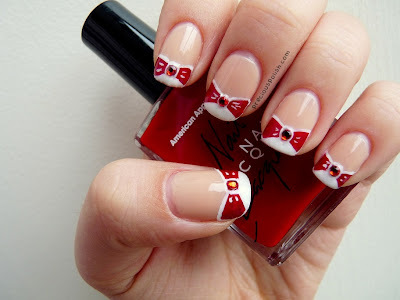 With a white striping polish I outlined the bows and added a red rhinestone in the centers to finish them off. I hope you've been liking these holiday manicures :) I'm trying to think of new ideas that haven't been done before and I hope to have a few more for you before Christmas. In the mean time, catch me up! Send me links to your holiday nails, or tweet them to me @preciouspolish! ahh this is so cute!! i love how it doesnt scream christmas, but is still festive (: happy holidays! Yay congrats on your first semester! Woohoo! THESE ARE SO SO CUTE. i may have to replicate them before christmas is over. or at any time. ever. Hehe, they kind of do! Thank you! Haha thank you, thank you! LOL no problem! Glad to be spreading the nail polish joy ;D But aren't they seriously the most awesome set of creme polishes everrrrr?! Haha yep, I think they could be year-round appropriate :D Thank you!